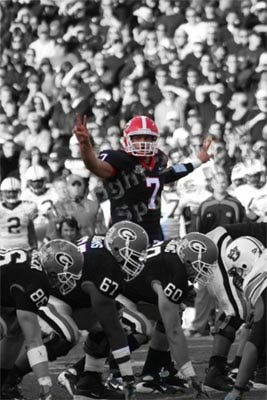 A few years ago, there was an infamous photograph of then underage University of Georgia Quarterback Matt Stafford hoisting an empty beer keg over his head at Talladega. It made the rounds on the Internet, bringing embarrassment to the University and a lot of spin/back-peddling. When I spoke to Stafford some months later, he told me that he realized how careful he needed to be in the future. In fact, he said he did not have a Facebook or MySpace account. Well times have changed...maybe. 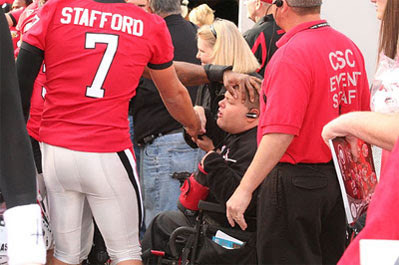 Stafford has a Facebook account, he has left UGA, and he is going to make a boatload of money from the Detroit Lions. Oh, but he also has a new set of photographs making the rounds. Deadspin, despite their half-hearted attempt at apologizing for the way they have treated Erin Andrews over the years, is back to their old tricks to draw traffic. They have posted a series of Stafford photos playing hard with a bevy of beauties, putting party-boy Stafford back in the "social" limelight. 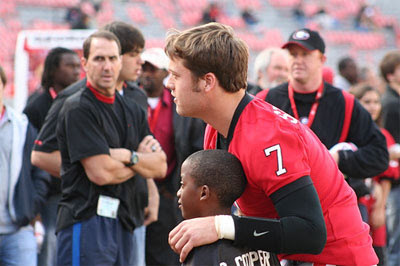 So Stafford seems to have forgotten the lessons he supposedly learned at UGA. It may be time for his father, his agent, and his handlers to take him out to the woodshed and remind him of how much bigger and harsher the spotlight is now. His every move will be scrutinized and reported, and it will have no bounds. If he is going to be the leader of the Lions, he will need to start acting like a responsible leader and role model.